I make Two Ingredient Southwestern Chicken pretty frequently. It's versatile, easy, and delicious- it can be shredded, diced, left whole, whatever is needed. You can make several meals out of it, and you can freeze what you don't use right away. You're busy; this is something that doesn't require a lot of prep or fussing over. Place chicken breasts evenly in a 6 quart slow cooker. Cut larger breasts in half so everything will cook at about the same rate. Sprinkle chicken breasts lightly with salt, if desired. Pour both jars of salsa evenly over chicken to cover all. Cook on low for 8 to 9 hours or high for 4 to 5 hours. Of course, you know these times are approximate- everyone's crock pot seems to cook a little differently. When the chicken breasts are done to your liking, you can leave them whole (with the sauce spooned over them), chunk them for stews, shred for tacos, whatever you like. It will look like you have a lot of sauce in the pot, but when you shred the chicken, it soaks up a lot of it. This chicken freezes really well for a long time. I don't think you're supposed to freeze cooked chicken for over about 6 months, but I found a bag of this in the back of the freezer the other day (unlabeled, arrgh), and it might have been close to a year old. It was delicious and we didn't die, but you should probably be more responsible than that. 1 (14.5 oz.) can diced tomatoes (do not drain) I like Hunt's Fire Roasted Diced Tomatoes. In a large saucepan, combine rice and chicken broth. Bring to a boil and let simmer, uncovered, for 5 minutes. Add everything else, bring to a boil again, and simmer, uncovered, for another 5 minutes to allow flavors to blend. Freezes well. *Cook's Notes: Use a good, flavorful salsa when preparing Two Ingredient Southwestern Chicken. I have used several different kinds and flavors, including a peach salsa that was very good. 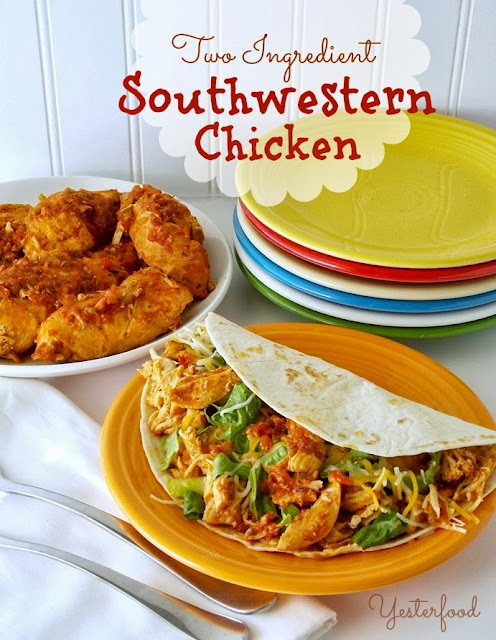 Southwestern Chicken may have been taken to some of these fun parties! This post was written by me and was originally published at Texas Women Bloggers. You can't beat a recipe that only has two ingredients. I make a lot of soups over the winter, so I'll add this one to my menu. Kristia, this is the kind of hearty dish that we like during the colder months, too! If you try it, I hope you enjoy it! yum.. can't wait to try! Ummm...yum! I like easy! Thanks for sharing! Oh Goodie! Two-fer Recipe Post - Sounds delish, and I just LOVE food you can stuff into a flour tortilla. JoAnn, me, too! I will eat almost anything in a tortilla! :) Thank you for stopping by! Joy, wow, this looks way too delicious to be so easy! I had to chuck over you finding it in the back of the freezer because I've done a few times! Love the idea of eating this in a tortilla and a perfect during the week meal when things are so busy! Thank you for sharing your recipe and pinning! Have a great evening and see you tomorrow at Let's Get Social! Wow! Two ingredients! I'm saving this! And so glad you lived to write another recipe for us! Once I pop something into the freezer I figure it's good for a lifetime! Probably taking too many chances but that's the way I expedite my cooking! That chicken sounds wonderful and I think I have everything for both it and the soup out in the cupboards -- I'm trying to live out of them this week! I loved your freezer comment "It was delicious and we didn't die" but may I just add I love I am so glad I invested in a FoodSaver! Extends that year even longer! I have wanted to get a food saver for a long time- I may have to ask Santa for one this year! :) Thanks for the idea, and thank you for coming by! You will love it -- wish I had gotten mine long ago. I'm asking Santa for some of the accessories this year! Thank you, Ashley, we really like it! :) Thank you for coming by! Joy, I have made chicken with salsa in the crockpot in the past and it is delicious. It's definitely time to get the crockpot out and make it again. But what I really want to try is that soup recipe. After I make the chicken, of course. Yum! Oh, this looks so easy! And I love a good crock pot recipe. I'm pinning....maybe I'll do it this week as I'll be getting home late a couple of days and this will be ready when we get home. Thanks for sharing. Visiting from the Good Neighbor Blog Hop. I just made this for tacos today. So easy and good. I wanted to let you know that you will be featured tomorrow at The Good Neighbor Blog Hop. Oh my goodness..two ingredients and a crockpot! You know I pinned it. I love everything about this recipe. Thanks so much for coming by the Good Neighbor Hop. Well this is 3 times the fun - the original - the tip to use them shredded in tacos and the soup recipe - so three times the thank you! I love an easy comfort meal for cool November days. Stopping in again today from the Grand Social. What a simple and versatile recipe. My sister and I collect vintage cook books too. We just did a blog on a recipe called The White Moon Cake. I would love it if you would check it out. I love easy! Thank you for sharing! Definitely pinning. That two ingredients recipe is fantastic! And black bean soup is one of my absolute favorites. Hope you have a wonderful day. What a great recipe, we would love both of these recipes! Hope you are having a great day and thank you so much for sharing with Full Plate Thursday! I just had Mexican food for lunch, but now I am wanting more! These dishes look great. This post was the most viewed at the In and out of the Kitchen Link party! You will be featured at the next party. Thanks so much for sharing this bit of delicious. What a great busy weekday meal. I'm always looking for new crockpot recipes to try. Thanks for sharing at Inspire Us Thursday on Organized 31. Oh, two recipes! They sound great! Taking one meal and adding or changing it to another is always a great idea. Thanks for sharing the recipes and I teamed up with Linda @ The Tumbleweed Contessa for What'd You Do This Weekend and featured this post :-) Have a great night! I love this quick and easy recipe, and the photos are really pretty! I have always loved those brightly colored dishes but haven't gotten them for myself. I'll just enjoy looking at yours :) Thanks so much for linking up with us at Saturday Night Fever! I love doing chicken and salsa in the crock pot! Sometimes I add some frozen corn to the finished product to cool it down for the kids. Yummy! We make this all the time and my family loves it! I originally got the recipe from a weight watchers group meeting! I haven't tried the soup for the leftovers but I will be!! Looks amazing, love love love that you use two ingredients, like Ina would say, how easy is that?? Thank you for sharing at my Chicken Party! I pinned these delicious looking recipes! Thanks so much for stopping by Saturday Dishes and linking up. 2 ingredients had me interested, but throw in the crockpot, and I'm all over this dish! I love such easy meals! Thanks for sharing at Saturday Dishes- pinning! I have three crock-pots and many times use all 3 of them at one time. I love easy recipes! Thanks for linking up at Saturday Dishes "CROCK-POT" blog hop. I am featuring this recipe on my blog. Stop by and check it out. Your picture links bank to you.